This is a single carbonic phase when trapped, but when cooled to 100 C this would separate into 2 immiscible phases within the fluid inclusion These 2 fluid components will have X - CO2 compositions of 0.97 and 0.04 (The intersections of the solvus with the 100 C axis). In theory you might expect to see this as a vapour-rich 2 phase fluid inclusion with a small liquid phase. But the liquid phase is so small, as calculated here, that it will be invisible. The lever rule is used to determine the volume ratios of these two components which will exist within cooled the fluid inclusion. 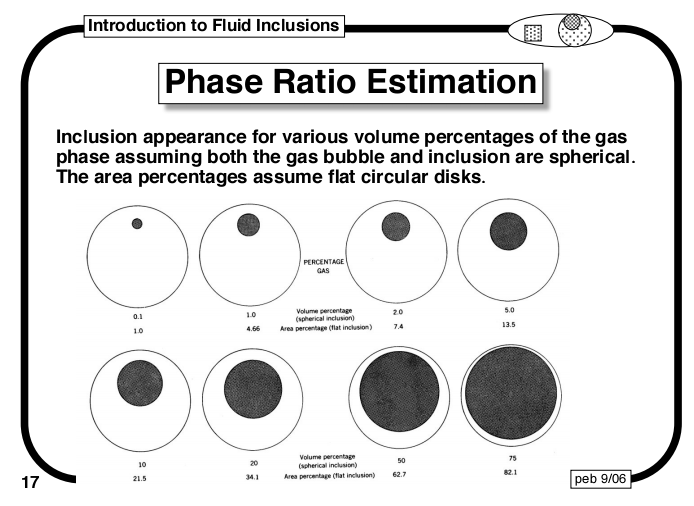 In a spherical fluid inclusion, this small 5% quantity of aqueous phase will be invisible and the inclusion will appear to contain just a single phase carbonic fluid. Despite actually forming from a 90% aqueous fluid. Any salinity in the system would further reduce the visibility of the aqueous phase. With a volume % of 95% CO2 as calculated above the 5% liquid phase would not be visible at all. Microscope observations will be more difficult than shown in this careful diagram because of the substantial refractive index changes between the fluid phases and the quartz. 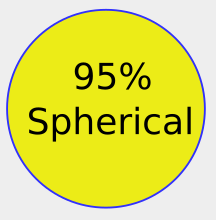 This image shows an inclusion outline in blue with a 95% volume spherical gas bubble in yellow. The barely visible blue ring represents the aqueous liquid phase of 5% and would be essentially invisible under the microscope as the overall inclusion size would be far smaller visually and the refractive index difference would also blur and conceal the boundary between the quartz host and the fluid filling the inclusion. This inclusion would appear to be purely CO2 filled although it could be a product of heterogeneous trapping from a fluid which had as little as 5% CO2 with 95% H2O, which separated and was trapped at 200 C at the red star on the carbonic side of the solvus curve in the example shown. When viewed at a temperature of less than 31.5 C (the critical point temperature of CO2) this inclusion will have a liquid CO2 phase with a super critical CO2 gas bubble as the pressure is above the critical pressure of the CO2. The immiscible, heterogeneous aqueous liquid phase will still be imperceptible.